Mayo Clinic’s Division of Pediatric Cardiology is on a roll, according to Division Chair Frank Cetta, M.D. Mayo has performed more operations for Ebstein’s anomaly and more transcatheter tricuspid valve implantations for patients with Ebstein’s anomaly than anywhere else in the world. The Long QT Syndrome/Genetic Heart Rhythm Clinic for patients with channelopathies and the pediatric heart transplant program have been busier than ever in the last five years. The Todd and Karen Wanek Program in Regenerative Medicine has three first-in-child clinical trials under- way for cell-based therapy in congenital heart disease. The division’s state-of-the-art review course for congenital heart disease and the annual congenital echocardiography course are considered among the best in the nation. “Mayo’s pediatric cardiology had a heyday in the 1970s when surgical treatment for complex cardiac lesions such as atrioventricular septal defect, truncus arteriosus and single ventricles (Fontan operation) were developed. The division is well balanced, with senior consultants who have decades of experience working alongside younger consultants — five of whom have joined the practice in the last four years. The newcomers bring vibrant energy to the program, according to Dr. Cetta. Richard Bram, M.D., Ph.D., chair, Mayo Clinic Children’s Center, couldn’t agree more. Dr. Cetta explains the advantage of a pediatric program ensconced within an adult program — a pediatric hospital within an adult hospital; a pediatric cath lab within an adult cath lab; pediatric cardiologists, cardiac surgeons, transplant surgeons and interventional cardiologists working alongside world-renowned adult counterparts. As patients transition from pediatric to adult care, they can work with the same nurse coordinators in the same clinic in the same practice for their lifelong care. 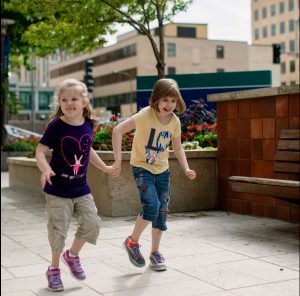 Madison and Sydney Rippy had heart transplants at Mayo Clinic in Rochester in 2009 and 2012, respectively, at age 3. 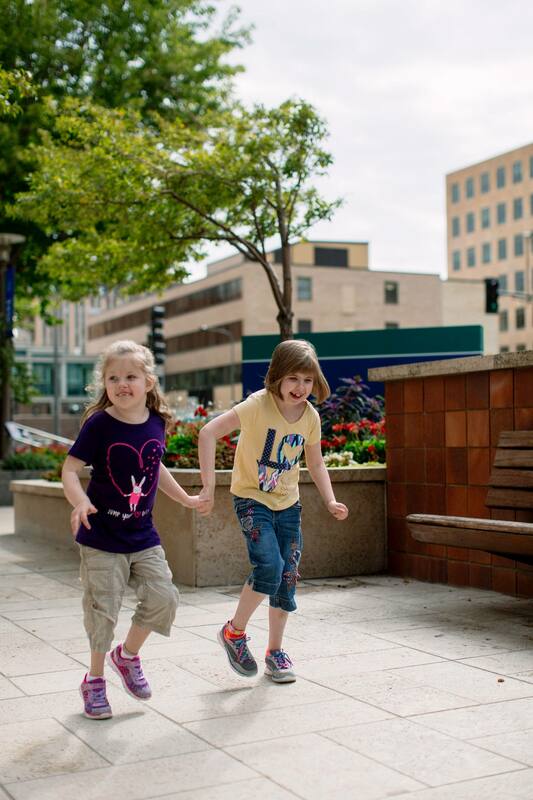 The sisters from Blaine, Minnesota — now ages 10 and 7 — had dilated cardiomyopathy. Both were in heart failure, were on life support and would have died without a transplant. In the years since those transplants, Mayo’s Pediatric Heart Transplant Program has flourished, in part due to the interest, enthusiasm and commitment of Jonathan Johnson, M.D., the program’s medical director since 2012. “I fell in love with Mayo Clinic when I interviewed during medical school,” he says. Early in his residency in pediatrics at Mayo, he was leaning toward specializing in pediatric hematology/oncology. Dr. Johnson has contributed to 65 peer-reviewed publications and eight book chapters in his short time on staff at Mayo Clinic. He’s eager to get the word out about Mayo’s expertise in pediatric heart transplantation. Despite the success of Madison and Sydney Rippy’s heart transplants, they will need to take immunosuppression medication for the rest of their lives, which is particularly hard on the kidneys. The sisters could need kidney transplants in the future. But that’s not the worst of it. Heart transplants in children usually only last 15 to 20 years, which means the girls will likely need new hearts in early adulthood. “Organ transplantation is a miracle for families like the Rippys but has very severe consequences for young children due to immunosuppression therapy and other lifelong side effects,” says Timothy Nelson, M.D., Ph.D., director of the Regenerative Medicine Consult Service for the Transplant Center. In the future, children like Madison and Sydney may have better options. Mayo Clinic is actively studying regenerative medicine therapies that could delay or eliminate the need for transplant. This includes the only FDA-monitored clinical trials for regenerative medicine therapies in pediatric heart patients. Mayo Clinic has three of these phase I trials underway. Madison (Madi) Rippy was 2 years old when she had a stroke and was taken to Children’s Hospital in Minneapolis. An X-ray showed a severely enlarged heart, and the cardiologist recommended the family go to Mayo Clinic for transplant medicine expertise. Madi received a heart transplant a year later, and the family met Jonathan Johnson, M.D., who was completing his fellowship. Three years later the Rippy’s younger daughter, Sydney, also needed a heart transplant. Both girls had dilated cardiomyopathy. Mayo had monitored Sydney since birth due to her sister’s condition. Sydney didn’t show any evidence of a heart problem until she was 2. Recently Madi, now 10, was taken to Mayo Clinic by ambulance with a serious blood clot. When her parents arrived at the hospital, Dr. Johnson was waiting for them. “For them, the transplant center is a place of comfort,” says Rippy. “We’ve gotten so spoiled at Mayo. We know other transplant families who wait days for test results and weeks between appointments. Mayo does team- based care like nowhere else. We’re never rushed through appointments. They treat us with the utmost care for as long as we need it. Dr. Johnson wrote letters on our behalf when our school district tried to change our daughters’ school because the special education classroom population was too large. Sydney Rippy needs orthopedic surgery to lengthen a calf muscle and could have the procedure closer to home. The Rippys have chosen to have the surgery at Mayo Clinic. The Rippys are hopeful about the future for their daughters and other transplant families. “The regenerative medicine therapies Mayo is pursuing may mean other families won’t have to go through what we’ve gone through,” says Rippy. “We’ll never get to hear the word ‘cured’ with our children, but who knows where medical science will be in 10 years? Our kids and others may be able to have a more normal or typical future. This article is extracted from a longer feature in Alumni Magazine, Issue 4, 2016. 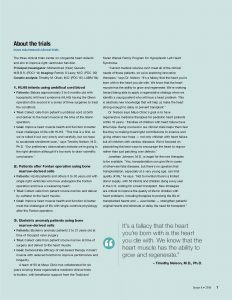 Other sections in the full article discuss the ways that adult cardiac care and research expertise benefits pediatric patients, electrophysiology and echocardiography programs, and special programs for rare conditions. What a great write up. 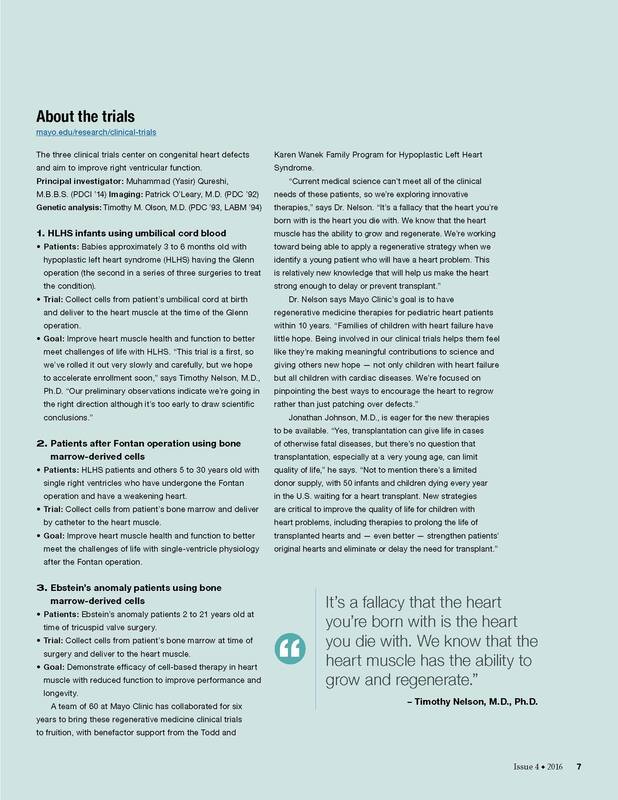 I never knew about regenerative medicine for young hearts.